Whether you have a dog, cat, ferret, or hamster, pets are like family to many. We let them cuddle up with us on the couch, sleep on top of our pillows, and play all throughout the house. Unfortunately, no matter how much we bathe and keep them clean, there always seems to be a lingering odor that follows them around. This could be caused by little accidents on the floor or deep embedded pet hair in the carpet, but no matter what is causing the smell, there are ways to keep the musty odors at bay. If you have a pet, it is likely that fur and dander are trapped in the carpet fibers, furniture, and even the curtains. That’s why vacuuming every other day is key to keeping pet hair to a minimum and odors away. For a deep clean, sprinkle baking soda on carpet, rugs, and surfaces made out of fabric, such as the couch or pillows. Let the baking soda sit for several hours or overnight to neutralize the area and trap odors. After a good amount of time has passed, vacuum up the baking soda. Repeat this as often as necessary to create a nice, odor-free home. It’s important to also clean your vacuum out after every use to keep it running efficiently. If your pet sleeps with you at night, it is important to make sure you wash your bedroom linens at least once a week. For your comforter or duvet, follow the manufacturer's directions and have them properly cleaned on a monthly or bimonthly basis. Don’t forget to clean your pet’s bed as well. Most will have a removable cover that you can simply slip off and wash.
Pet hair also collects on hard surfaces such as your furniture and wood or tile floors. Using a broom and microfiber mop, sweep and mop your home every couple of days. Make sure to get into the corners, as hair likes to collect in those regions. 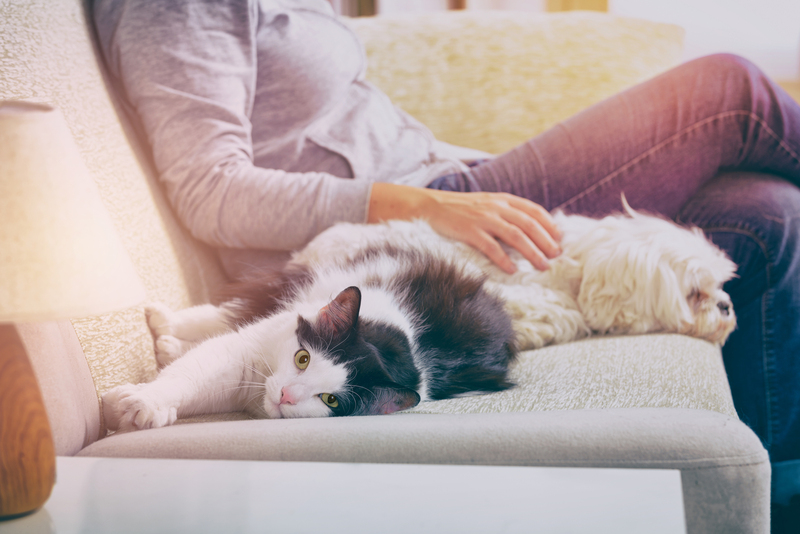 For furniture, use a microfiber cloth and your favorite dusting product, making sure it is non-toxic to your pet, to wipe down hard surfaces in your home. Make sweeping and dusting part of your weekly cleaning routine and you’ll begin to notice the difference. If man’s best friend has left a few accidents throughout your home, it’s important to clean them up right away. But if you don’t get to them soon enough, they can leave behind a stain and odor. If this has happened, consider reaching out to a professional carpet cleaner to help bring deep stains and odors to the surface for a clean that will not only leave your carpet looking great, but will also leave your home smelling fresh.